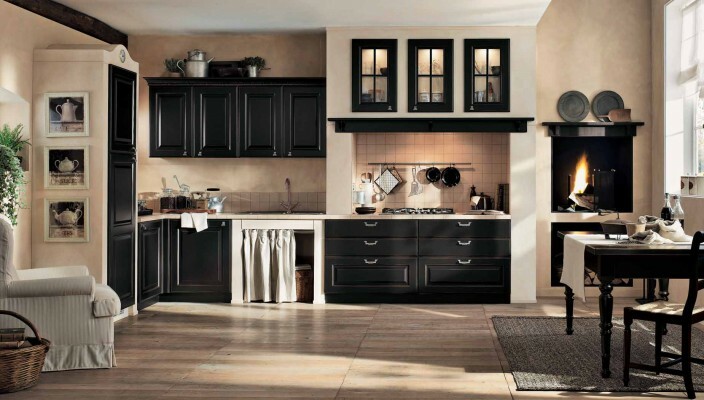 Stylish kitchen interior in the classic style that uses a black and cream finish for most of the parts with additional furniture for maximum functionality. Using the color schemes of the classic kitchen, the all new design of this modern kitchen is about using black and cream. While the black shade has been used for finish of the doors, frontal portions of cabinets, racks and other features of furniture, cream shade has been used for the walls. With space for all essentials, this is a complete kitchen for modern homes making use of every corner of the room with essential furniture.